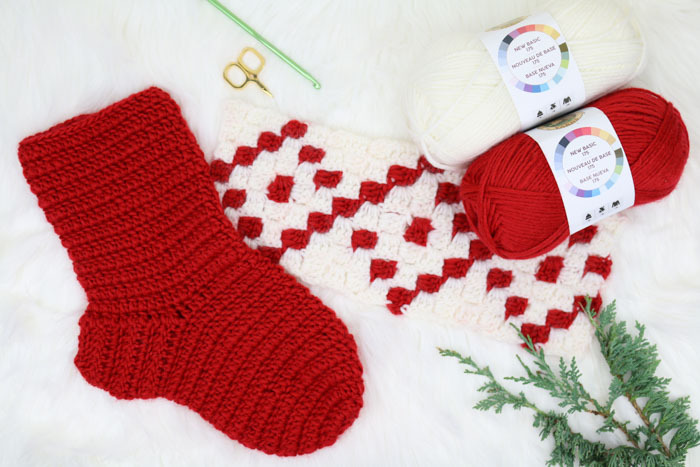 This timeless, Nordic-inspired crochet Christmas stocking pattern uses the corner-to-corner stitch to create a gift that will be valued for years to come. Get the free pattern below or purchase the ad-free, printable PDF with written c2c instructions here. 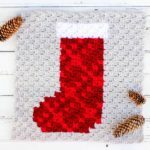 I’m so excited this week because I’m not just sharing my crochet Christmas stocking pattern, I’d like to introduce you to a whole collection of Christmas crochet and knit projects that were designed by my fellow blogging friends in partnership with Lion Brand. 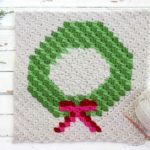 This “12 Week of Christmas” collection includes my stocking pattern as well as other Christmas-themed gifts, like an amigurumi gnome by 1DogWoof, plus plenty of other non-Christmas projects like sweaters, afghans, scarves and hats that would make wonderful crochet gifts this season. 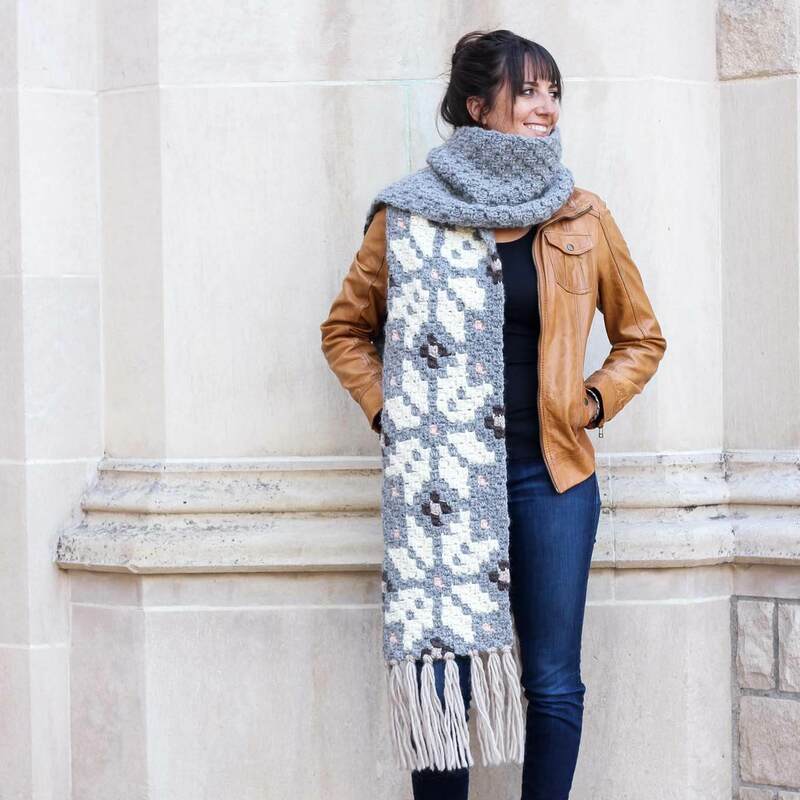 For each of these projects, Lion Brand has created a kit that includes all the yarn necessary to make the project, plus a printed copy of the pattern. And all the kits are 20% off until Christmas! Check them all out here. 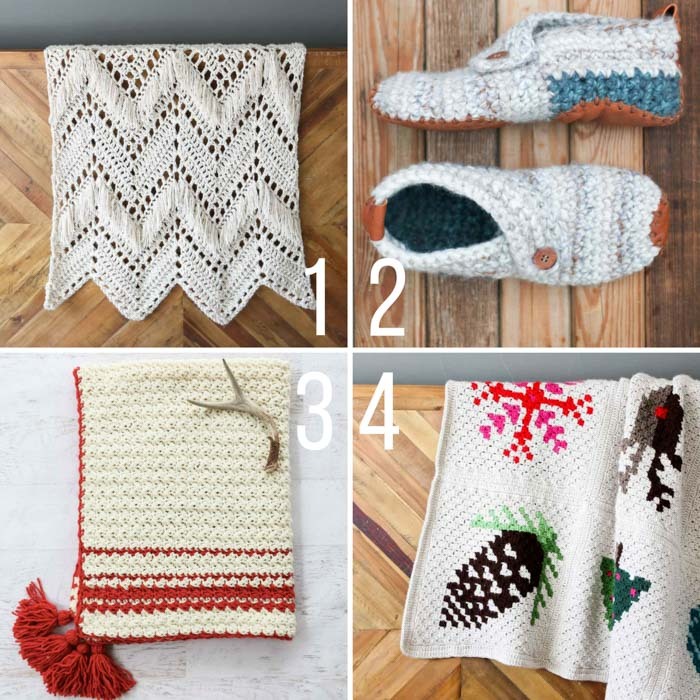 I think these kits are a great way to get inspired for some crochet gift giving, but maybe even better, they’re also a way you stash away a little selfish-crochet project for once you’re doing making and doing for everyone else this season. Wouldn’t it be great to know you had a kit waiting for you to crochet a project for yourself come January? Sign me up. 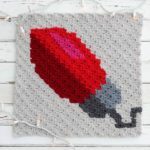 For my contribution to the 12 Weeks of Christmas Collection, I wanted to create a crochet Christmas stocking pattern that was modern, yet timeless and enduring. My hope is that this is a stocking you can make for your kids or your grandkids and they’ll still be happy to pull it out and hang it up in 20 years. Every year, I still use a Christmas stocking my Grandpa Rudy latch-hooked for me when I was a small child. Using it on Christmas morning is one of my favorite traditions. 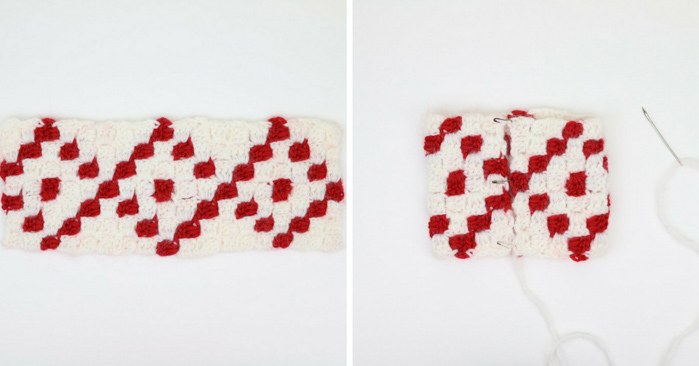 Even if you’re not familiar with the corner-to-corner crochet (C2C) stitch, this is a perfect project to learn on. 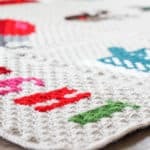 The C2C portion of the pattern is quite small and I’ve got a video tutorial about corner-to-corner that’s geared toward absolute beginners. Once you watch that, you can learn how to switch colors in this post. (And you can find all my free C2C patterns here!) 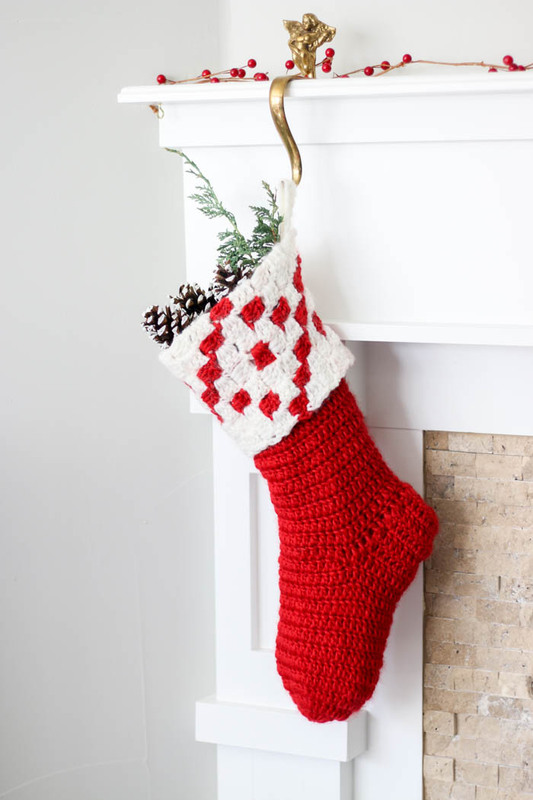 The rest of this crochet Christmas stocking pattern is as basic as some good old double crochet. 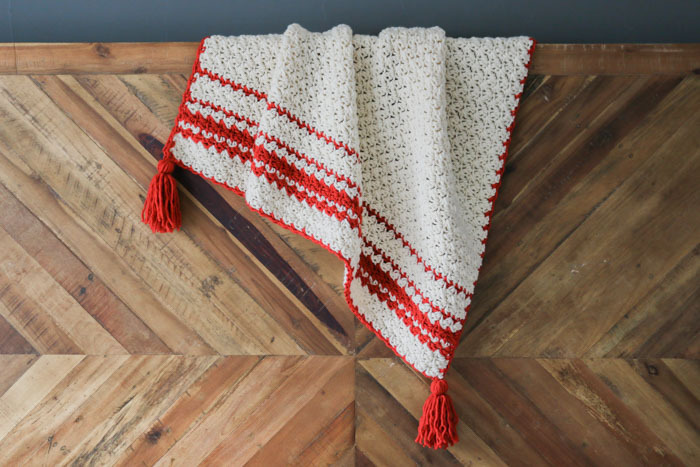 If this is your first time crocheting with Lion Brand’s New Basic 175, I think you’re going to love how fluffy and luxurious it feels! You can pick up the kit that includes all the yarn you’ll need for this pattern right here. 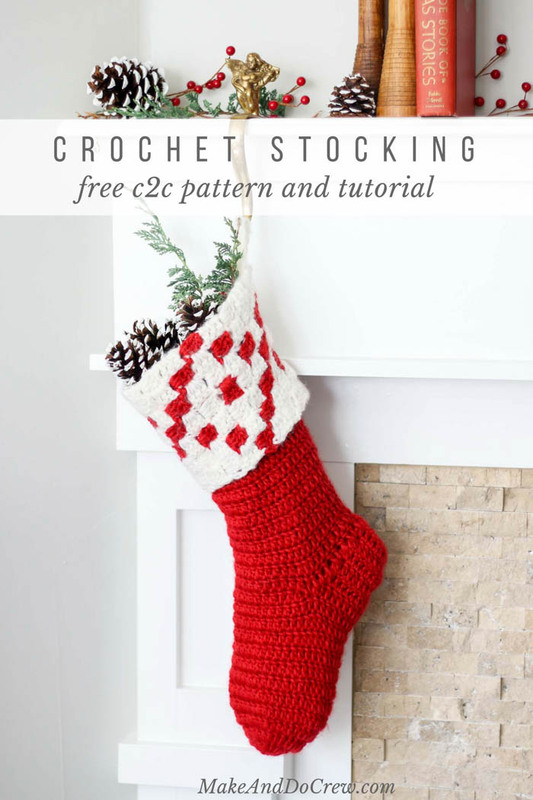 You can find all my free corner to corner crochet patterns here, including the Nordic Super Scarf pattern which I think has a similar Scandinavian vibe to this c2c stocking pattern. Do not re-publish this pattern as your own. You may make items to sell with this pattern. In exchange, credit Make & Do Crew as the designer and link back to this post. Do NOT use my photos as your own sales photos. ­­You can read my policies here. Now let’s make something awesome! Purchase the ad-free, printable PDF with line-by-line graph instructions for $2.75 here. Purchase a kit that includes all the yarn you’ll need, plus a copy of the pattern here. 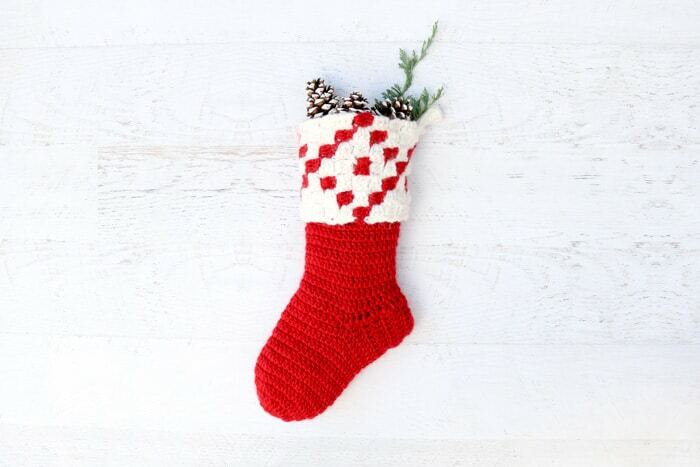 This Nordic-inspired stocking is made using traditional crochet techniques as well as the corner to corner stitch. The result is a striking accent to your Christmas mantle and would be beautiful as part of a series in different colors. • To work this corner to corner graph, begin with the pixel (tile) in the lower right corner. This will correspond to Row 1 in the written pattern if you’re working from the printable PDF. 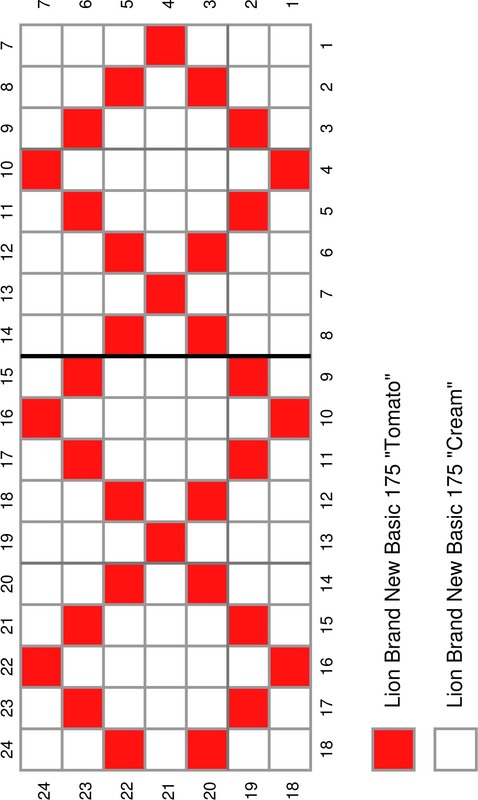 • It can be extremely helpful to cross off each row in the graph and/or written pattern as you work it. The graph can can be found here and the written pattern is available for purchase here. • Because the back of the c2c piece will be hidden inside the stocking, you may choose to take some liberties in how tidy you are with switching colors and weaving in ends. Using larger hook, complete upper band according to graph pattern. Fasten off last MC tile and last AC tile leaving a 20” tail on both. Weave in remaining ends. With RS facing out, fold upper band in half so that the sides meet in the middle. 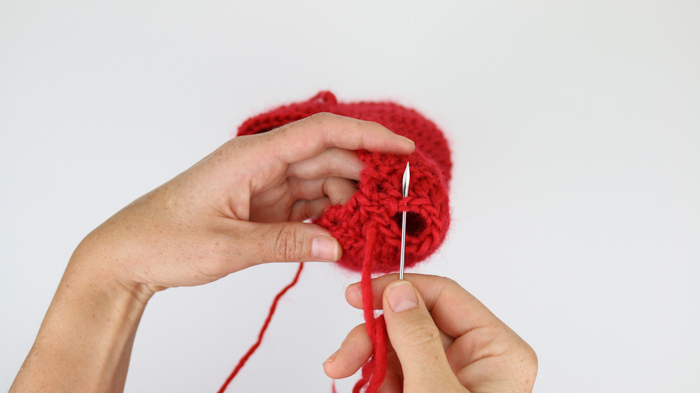 Use a tapestry needle and the tail of AC yarn, seam the sides together with the mattress stitch. • The stocking toe is worked in the round in a spiral, meaning that you won’t chain 1 at the beginning of each round. Place a stitch marker in the last stitch of the round to keep track of where a new round begins and move the stitch marker up as you work. Foundation: Using MC yarn and the smaller hook, make a magic circle. Measure toe section inside upper band as described in the overall pattern notes. Rounds 6-11: Rep Round 5. Do not fasten off. Remove stitch marker. 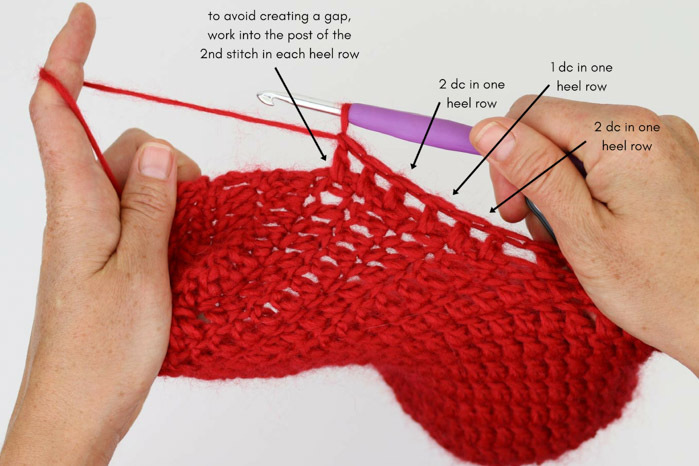 • The heel is worked back and forth in rows, continuing from where the toe left off. After Row 1, the heel will be completed between the two stitch markers. • The ch 3 at the beginning of a row always counts as 1 dc. Fasten off, leaving a 15” tail. Fold heel flap in half and use a tapestry needle and the tail from the heel section to seam the back of the heel with the mattress stitch. • The ankle is worked in the round just as the toe section was. The first round will be worked along the top edge of the toe section and along the top of the heel section. 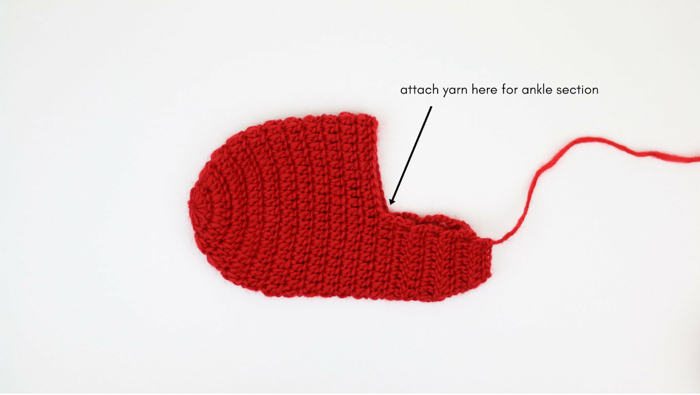 Attach MC yarn at the intersection of the heel section and the toe section on the left side of the stocking (right side for left-handed crocheters). Place stocking inside top as pictured below. (Nine rows of the stocking ankle should be visible below the upper band.) Pin in place using safety pins or stitch markers. Using a tapestry needle and a strand of AC yarn, sew top to the stocking, taking care to work small, inconspicuous, stitches into only the AC tiles on the c2c band. Repeat this process using MC yarn (the tail from the stocking or upper band) and working only into MC tiles on the c2c upper band. I find it looks best to place all your seaming stitches around the top of the stocking edge, which ends up being about the middle of the c2c piece. You’ll want to create a hanging loop that will be long enough to be sewn to the interior edge of the stocking (not just the upper band) when folded in half. This will make the hanger sturdier and ensure the stocking doesn’t stretch out when hung. For the sample, 30 ch achieved this. Fasten off leaving a 20” tail. Fold hanger in half to form a loop. Place hanger in stocking so that the bottom of the hanger meets the top of the stocking edge. Using existing tail, sew into the stocking and c2c top. 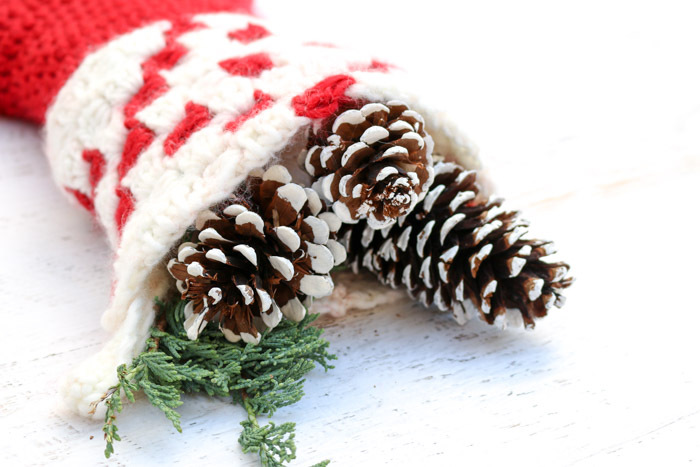 Hang your new handmade stocking by the chimney with care and wait for St. Nicolas soon to be there! You’re welcome Yolanda. It’s my pleasure!